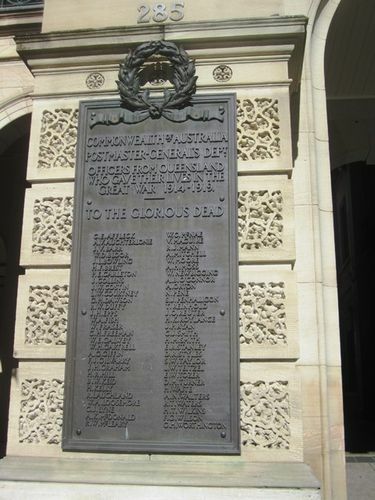 The honour roll commemorates employees of the Postmaster-General`s Department in Queensland who died in service or were killed in action during World War One. Before a large attendance tne Minister for Repatriation unveiled a bronze memorial tablet at the General Post Office on Saturday morning, in honour of the employees of the Postmaster General 's Department throughout Queensland, who lost their lives in the late war. The tablet contains 58 names. The Deputy Postmaster General, Mr. Templeton, who presided, said that the number of employees at the outbreak of the war was 2000. Of those 430 enlisted, and 58 paid the supreme sacrifice. Maryborough Chronicle, Wide Bay and Burnett Advertiser (Qld), 6 March 1922.